'The Grinch', based on Dr Seuss’ beloved holiday classic, tells the story of a cynical grump who goes on a mission to steal Christmas, only to have his heart changed by a young girl’s generous holiday spirit. Funny, heartwarming and visually stunning, it’s a universal story about the spirit of Christmas and the indomitable power of optimism. Academy Award nominee Benedict Cumberbatch lends his voice to the infamous Grinch, who lives a solitary life inside a cave on Mt Crumpet with only his loyal dog, Max, for company. With a cave rigged with inventions and contraptions for his day-to-day needs, the Grinch only sees his neighbours in Who-ville when he runs out of food. Meanwhile, down in Who-ville, Cindy-Lou Who - a young girl overflowing with holiday cheer - plots with her gang of friends to trap Santa Claus as he makes his Christmas Eve rounds so that she can thank him for help for her overworked single mother. As Christmas approaches, however, her good-natured scheme threatens to collide with the Grinch’s more nefarious one. Will Cindy-Lou achieve her goal of finally meeting Santa Claus? Will the Grinch succeed in silencing the Whos’ holiday cheer once and for all? The 'The Grinch' competition has now closed. Winners will be announced shortly. Competition opens at 5pm AEDT on Sunday 17th March 2019 and closes at 11:59pm AEDT on Sunday 24th March 2019. Five winners will be chosen at random on Monday 25th March 2019. To successfully win, entrants must fulfil the above entry conditions before the time the competition closes. Current members/followers are eligible to enter the competition. Only one entry per person. Only one winner per household. To be a valid winner, the entrant must not have won a prize from SWITCH within the last 28 days. Each winner will receive one Blu-ray copy of 'The Grinch'. By entering, you agree to receive occasional emails from SWITCH in the future. If you decide to unsubscribe from these updates, any further entries will not be applicable. Only Australian residents are eligible to enter. 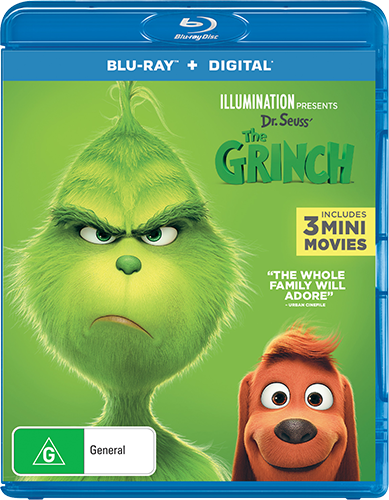 'The Grinch' is available on 4K Ultra HD, Blu-ray, Blu-ray 3D, Digital and DVD on Wednesday the 20th March 2019 from Universal Sony.